When the most influential poet of the 20th Century penned The Waste Land in 1922, he was also dutifully employed as a clerk in a London bank. And by “bank” I don’t mean your neighborhood credit union where they raffle-off family getaways to Disney and give lollipops to cute kids, but an austere English bank with officers who wore bowler hats and secretly idolized the pre-transformation Scrooge in A Christmas Carol. T.S. Eliot worked in the foreign transactions department at Lloyd’s bank from 1917 until 1925 (from the age of 29 until he was 37). He punched in Monday through Friday (plus one Saturday a month) from 9:15 am to 5:30 pm. Like many Americans today, he only qualified for two weeks of vacation a year. 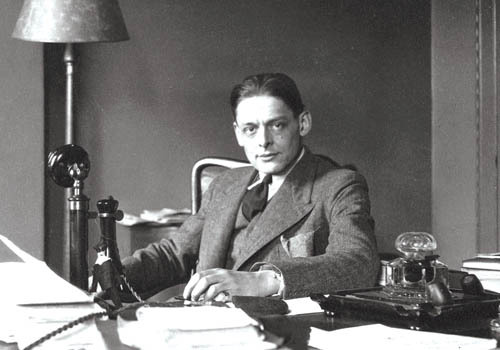 If Mr. Eliot had to have a day job, why is it that writers and poets today are so cagey about what they do to pay the bills? We all know that book reviews and smart literary novels do not put one on the road to financial independence. To paraphrase Winston Churchill, never before in the field of letters has so much been written, by so many, for so little compensation. And while nobody except maybe Jonathan Franzen and Bill O’Reilly (no political or emotive relationship is implied by this coupling) are making a bundle from book sales, why does it always hurt when you discover that a promising novelist is also the associate editor for Grillin’ Times USA, the official trade publication for the American Outdoor Grilling Manufacturers Association? When I learned that critic and famed literary blogger Maud Newton worked full-time as a legal writer, I was devastated. Maud Newton? The woman with 156,000 followers on Twitter, who knows every book person worth knowing, and has been on C-Span Book TV, she needs a day job? Isn’t there like a NEA grant for an irreplaceably significant literary personage? From that point forward I decided that I would, for the sake of my own sanity, assume every writer I stumbled across was making a killing from writing. It’s easier that way. If I learn of a promising young novelist, I assume he wakes up each morning in a fabulous pre-war Manhattan apartment, owns a DeLonghi espresso machine and works on his book each day for three to six hours, depending on his mood. In the late afternoon, he strolls downstairs to the mailbox and gathers up a medley of foreign and domestic royalty checks. On my own website, in my worryingly thin “About” section, I make no mention of the fact that I work full-time in the marketing department of a software company. Why? Maybe for the same reason that pop singers used to hide that they were married — it just doesn’t fit the image. It’s far more romantic to think of Jack Kerouac working as a railroad brakeman, zipping through the American landscape on the California Zephyr, than it is to ponder Eliot in the basement, Dr. William Carlos Williams treating a dying woman or the former U.S. Poet Laureate Ted Kooser (2004-2006) working as an executive at Lincoln Benefit Life Insurance Company in Nebraska. That’s why I’ll stick with denial, thank you very much. When I email this piece to Full Stop, I will picture an expansive, crowed Manhattan publishing office with dozens of staffers: kind of like the one depicted in Mad Men, but without the booze and typewriters. I’ll imagine that Editor-in-Chief Alex Shephard and Managing Editor Jesse Montgomery have just arrived in the office, Starbucks in hand, ready for a full day of well-compensated, literary-type imaginings that come with robust health insurance plans, a pension and lots of publishing junkets to Paris and London. Around noon, maybe Zadie Smith or perhaps Jeffrey Eugenides will stop by the office, and everyone will go for a lunch of pine nut salads with feta and avocado slices (no lunchtime cocktails in the 21st Century!). Maybe they’ll meet up with several young novelists who are living comfortably on their publishing advances! It would be a world where writers are well-paid and filled-to-the-brim with creative mojo; a world where they don’t have to do anything else but immerse themselves in the splendor of literature and craft and interior investigations. It would be a world so gentle, and so unrealistic, that maybe we wouldn’t need The Waste Land or The Sound and The Fury or even Shakespeare’s tragedies. Maybe it would be a universe too perfect to produce literature: a strange, unrecognizable world where Eliot couldn’t imagine J. Alfred Prufrock and those “restless nights in one-night cheap hotels and sawdust restaurants with oyster shells,” a world where bright young men and women never grow old, and never learn to wear the bottoms of their trousers rolled. You can find Robert Fay at robertfay.com or follow him on Twitter @RobertFay1.